Store and tote three of your favorite timepieces in this smart, vegan "leather" roll. Watches are functional fashion, and for collectors and travelers on a tight itinerary, one is never enough. 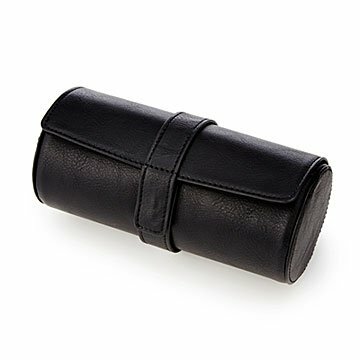 Store and tote three of your favorite timepieces in this smart, vegan "leather" roll. Inside, a soft, velvety interior keeps your collection protected and dust-free. Outside, the magnetic closure offers easy, anytime access. It makes a great gift for executives, groomsmen, and time zone-hoppers. Made in China. This is going to be a Christmas gift. I am extremely happy with this item and it's great quality! My husband is very hard to buy for...I know he will like it.